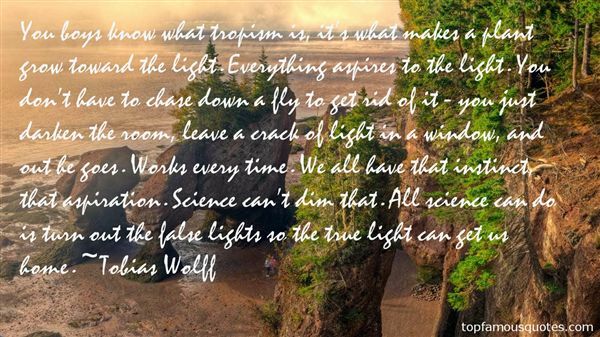 Reading and share top 6 famous quotes and sayings about Tropism by famous authors and people. Browse top 6 famous quotes and sayings about Tropism by most favorite authors. 1. "Tell me why the stars do shine,Tell me why the ivy twines,Tell me what makes skies so blue,And I'll tell you why I love you.Nuclear fusion makes stars to shine,Tropisms make the ivy twine,Raleigh scattering make skies so blue,Testicular hormones are why I love you." 2. "The writer found that certain freshwater crustaceans, namely Californian species of Daphnia, copepods, and Gammarus when indifferent to light can be made intensely positively heliotropic by adding some acid to the fresh water, especially the weak acid CO2. When carbonated water (or beer) to the extent of about 5 c.c. or 10 c.c. is slowly and carefully added to 50 c.c. of fresh water containing these Daphnia, the animals will become intensely positive and will collect in a dense cluster on the window side of the dish. Stronger acids act in the same way but the animals are likely to die quickly. . . Alcohols act in the same way. In the case of Gammarus the positive heliotropism lasts only a few seconds, while in Daphnia it lasts from 10 to 50 minutes and can be renewed by the further careful addition of some CO2." 3. "We all know, however, that the enormous weight of tradition, habit, and custom that occupies the greater part of our brain bears down pitilessly on the more brilliant and innovative ideas of which the remaining part is capable, and although it is true that, in some cases, this weight can balance the excesses and extravagances of the imagination that would lead us God knows where were they given free rein, it is equally true that it often has a way of subtly submitting what we believed to be our free will to unconscious tropisms, like a plant that does not know why it will always have to lean toward the side from which the light comes." 4. 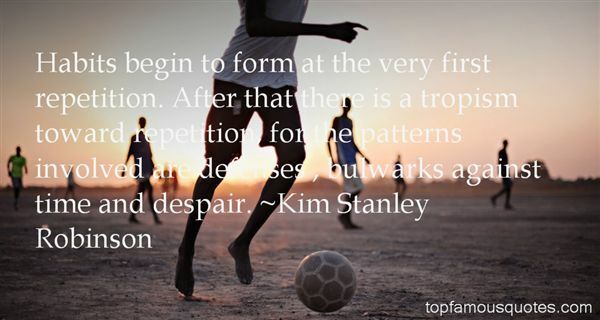 "Habits begin to form at the very first repetition. After that there is a tropism toward repetition, for the patterns involved are defenses , bulwarks against time and despair." 5. "He Sat in the window thinking. Man has a tropism for order. Keys in one pocket, change in the other. 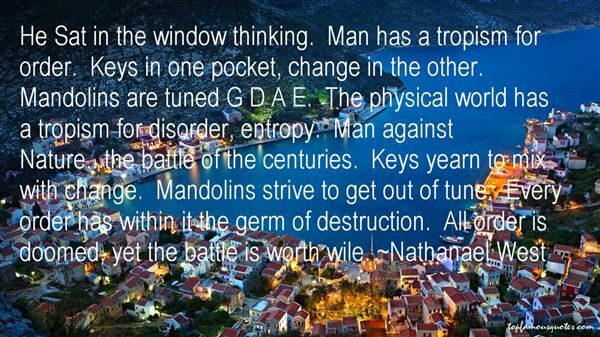 Mandolins are tuned G D A E. The physical world has a tropism for disorder, entropy. Man against Nature...the battle of the centuries. Keys yearn to mix with change. Mandolins strive to get out of tune. Every order has within it the germ of destruction. All order is doomed, yet the battle is worth wile." 6. "You boys know what tropism is, it's what makes a plant grow toward the light. Everything aspires to the light. You don't have to chase down a fly to get rid of it - you just darken the room, leave a crack of light in a window, and out he goes. Works every time. We all have that instinct, that aspiration. Science can't dim that. All science can do is turn out the false lights so the true light can get us home." I lived crazy really young. So now I don't need to go out and get nuts."